Most businesses are not completely satisfied with their Rules engines or statistical decision systems. Creating and editing rules or models is cumbersome and is usually done by I.T. staff. Performance is not optimal, and support for creating complex rules is limited. Powerful expression language that is also custom tailored to your business. This allows you to formulate complex logic with a minimum number of rules. IntelliSense powered web-based user interfance. 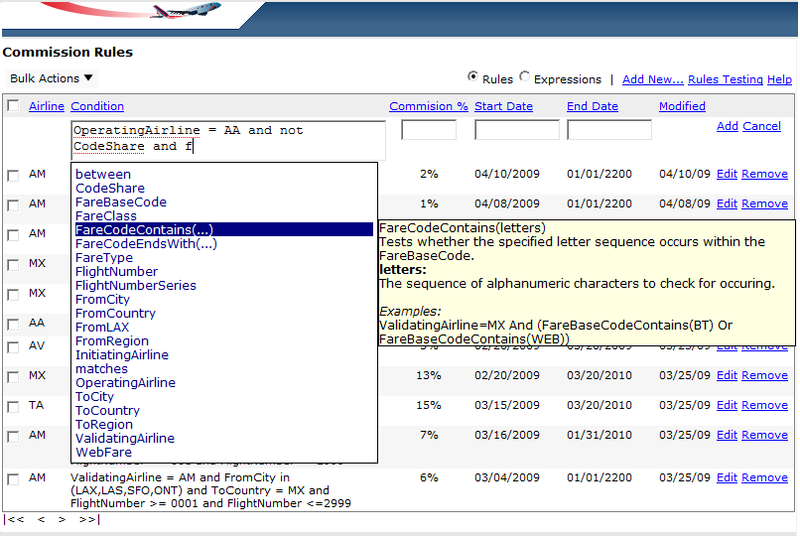 As you are entering rule condtions the IntelliSense feature provides autocompletion suggestions with summary information about each suggestion. This makes creating and managing even complex business rules a breeze. Extremely high performance resulting in low latency per transaction and high throughput. Customizable to fit your business needs like a glove. You can have custom language shortcuts specific to your domain. There is additional support for plug-in modules. KREDOR will work hand-in-hand with you to customize your rules engine (40 hours included with your purchase). Support for evaluating transactions in the context of previous transactions. This enables many compliance scenarios such as monitoring for suspicous activity in the money transfer and banking industries. You get complete flexibility in terms of access and hosting. It can be installed in your server environement or it can be hosted by KREDOR and integrated with your internal systems via a web service. Either way you get great performance and security. This Broker Cost Calculator compares online brokerage costs based on your trading habits as well as brokerage offerings, so that you can find the best online brokers for your money.